"This is a passion story: my passion, his passion, ours -- yours." 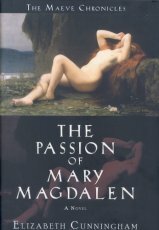 The most provocative woman in the Gospels, Mary Magdalen makes only a few, dramatic appearances. You always knew there had to be more . . .
Make way for Maeve, the feisty, outspoken Celtic Magdalen, telling her own story, on her own terms. No one's disciple, she is lover, bard, priestess, healer. And like her beloved Jesus, Maeve incarnates the divine mystery of love -- in the flesh. Flesh we first encounter stripped naked and displayed on a slave block in Rome. Born to warrior witches on an island in the Celtic Otherworld, raised to be a hero, Maeve is determined to find her lost beloved, a young man known to the Celts as Esus, whose life she once saved at enormous cost to herself. She has survived a shipwreck, trekked through the mountains of Celtic Iberia. Only an imperial power could slow this woman down. Snapped up by an aristocratic madam, Maeve becomes not only an accomplished whore but also has a startling encounter with the goddess Isis, whose story of loss and longing affects Maeve deeply. A failed attempt at escape results in even more bitter slavery when Maeve is sold to a spoiled young matron with a terrible secret. Here in the house of her enemy, Maeve learns the healing mysteries that become the basis of her life -- and his. When Maeve lands in mortal trouble, priestesses, whores, matrons, and even Rome's chief Vestal Virgin must unite to bring about her rescue. Free at last, Maeve goes straight to Palestine where she meets Mary of Bethany, a prickly would-be rabbinical scholar, and Ma (yes, his mother), a fey but autocratic matriarch. Neither one knows where Jesus is; he has vanished again. What is a girl to do but settle down in the good-time town of Magdala and open her own holy whore house, welcome each stranger as if he were a god -- until, at last, he is. Equally strong-willed and charismatic, Maeve and Jesus form a union that is as stormy as it is ecstatic. Throughout the terrain of the Gospels -- its healings, exorcisms, miracles, feasting, riots, and terrifying prophecy -- the lovers fight and make love, comfort and confront each other, infusing this unique passion narrative with passion in all its meanings. In this central novel of The Maeve Chronicles, acclaimed novelist Elizabeth Cunningham brings us a Mary Magdalen who defies all stereotypes -- old and new. Passionate and unrepentant, fierce and tender, Maeve leaps off the page, a luminous, embodied archetype for our time.